Young Severus Snape. 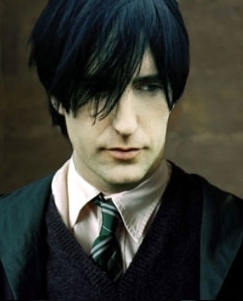 young severus snape hogwarts slytherin. Wallpaper and background images in the Severus Snape club tagged: young severus snape hogwarts slytherin. This Severus Snape fan art might contain bộ đồ làm việc, phù hợp với kinh doanh, and phù hợp với doanh nghiệp. That's Trent Reznor of Nine Inch Nails, he makes industrial metal. I'm sorry. I do not laugh at the maker of this image. Trent is one of my favourite artists. The idea of him as Severus Snape... hahaha... maybe he looks like him, but he is so different, that makes it funny. And my idea of Trents reaction to this. And btw, this is a picture where Trent is already like 35 or something. This is a picture of him much younger, maybe you can use it for another funny picture. I like Alec better. -shrug- but STILL. ^same here. Alec was hot. but STILL!